We’ve been down this route before. Corruption has and still is a worldwide malaise. Like all other diseases it has numerous ramifications as well as interpretations. It is endemic in all sectors of humanity and related to every area of public and private institutions. In other words, it is rampant and everywhere. Although this is a somber reflection, mankind has learned to live with it, despite continually trying to battle against it. Why this topic yet again? Well, it has been one of the most controversial ones in Spanish politics since the end of the dictatorship. Ironically and to a certain degree, there was more general honesty during the Franco regime, especially when dealing with public funds. One has to appreciate that once democracy was reinstated and Spain eventually joined the European Union, money began to pour in from European structural funds. By the mid 1990’s there was massive investment in all sorts of public and private projects of all kinds that elevated this country to the level of progress of the rest of Europe. But, pardon the pun, at a huge price. It also left an enormous trail of corruption and mishandling of funds in what came to be known as ‘Phantom Projects’. But let’s not deviate yet and backtrack to the transition period just after the death of the dictator to understand how this all came about. To start with, VAT was introduced. This opened Pandora’s Box. Not so much with goods but with services. The standard phrase when paying for the repair of your car, or the installation of a new electrical system in your house was, referring to the receipt, ‘with or without VAT?’ Next practice was the use of ‘black money’. The construction and housing boom began. Ah! But when you wished to purchase a second-hand dwelling the owner would request a certain percentage in cash. You signed the deeds at around 70% of the true price. Another scam, once democracy began to take effect was the abuse of the Social Security system. Without reverting to statistics a great deal of unemployed received ‘dole’ money whilst continuing to moonlight until their unemployment payments ceased. Common practice in many other parts of the world, but Spain was new to the game and the citizens just took if for granted. As time went by, and as we entered the XXI Century there wasn’t a sector of society, government institution and above all the banking world that wasn’t on the fiddle in one way or another. The scandals, especially political, began to mount, and many of the cases were related to the Conservative Party (PP) that led to the then Socialist secretary, Sr. Pedro Sanchez, in the forthcoming elections in 2016, during a public televised debate with Sr. Mariano Rajoy when he literally accused him personally of being corrupt. But the right wing sector was not the only party with dirty washing. Remember reporting some time ago on one of the largest corruption scandals in Andalucía by members of the ruling Socialist (PSOE) regional government by the famous judge Mercedes Ayala who ended up by indicting over 170 government officials including two ex-autonomous presidents and a Spanish government minister. Millions of Euros had been syphoned off into various pockets that were meant to have been spent on labour courses for the unemployed. More government corruption scandals have now appeared in Catalonia during the reign of Jordi Pujol of the right wing nationalist party (CDC) whilst he was president of the autonomous region for over 23 years. Apparently his party had been syphoning off 3% of the regional budget and the scandal that has only recently come to light has ended up with massive lawsuits indicting the whole Pujol family. Most of the money is somewhere outside Spain, although it has been established that suitcases full of 500 Euro notes continually crossed the border into Andorra, one of the world’s known tax havens. And right now we have two other cases that are in the hands of the judiciary. Banks and the Royal family. Enter the ‘Bankia affair’ followed by the case of ‘The Black cards’. In January 2010 several savings banks including Madrid join forces to convert into a proper bank. Sr. Rodrigo Rato was named president and tasked with the formation of a new bank that was eventually launched on the Spanish Stock Market in October 2011 with the grandiose name of Bankia. Millions of investors swarmed to purchase shares. Two months later the European banking authorities warned that the bank was in need of more capital to the tune of 1300M Euro. 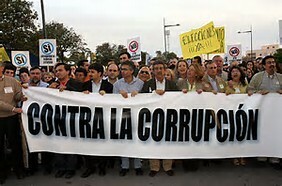 March 2012 the bank suddenly reported to Spain’s Central Bank that it was in need of another 5000M Euros! To cut a long story short the bank finally ends up being rescued and Sr. Rodrigo Rato and a sleuth of other culprits are before the judges. The caveat is that the top brass had, in the meantime issued themselves with credit cards known as the ‘Black Cards’ because they were actually black credit cards for ‘extra bank expenses’. This was by no means anything abnormal as most executives in corporate life carry company credit cards. However, not all were honest and enormous bills were presented as ‘company expenses’ including brothel rumpuses and huge dinner banquets for friends and family. Again, many are up before the judges. Finally we come to the Oscar nominated scandal that began years ago - 2006 - known as the ‘Noor’ case named after an institute of the same name set up by Princess Cristina, King Felipe VI of Spain’s sister and her husband, ex-handball player Iñaki Undargarin. The main object was a sort of marketing and publicity agency whose aim was to obtain funds for all kinds of so called non-profit projects that the institute was handling. Trouble is that behind the scenes Sr. Undargarin and his partners, headed by mastermind Sr. Diego Torres, designed, over the next few years an obscure network of companies and affiliates that ended up with all types of fraud, embezzlement, laundering and a plethora of other fiscal crimes that have now hit the culprits with a massive lawsuit. To cut a long story short Sr. Undargarin – who resides in Geneva – has been found guilty and has been charged with a six year jail sentence, his wife, Princess Cristina has not been charged. However, his lawyers will appeal. The press are still debating whether justice in Spain is biased. Whilst all these horror stories, especially the latter cases have been taking place, the political parties, including the present government, have been working behind the scenes to finally put a stop to the massive political corruption that has been going on for years. In August of last year, Sr. Rajoy (PP) and his coalition partner Sr. Albert Rivera of Ciudadans (every-which-way party) signed an agreement to literally ‘oust’ any member of their party who is indicted on corruption charges. Meanwhile, a purge had taken place throughout Spain and hundreds of ‘lesser’ politicians in all walks of life including small town councilors are being brought to justice. With a bit of luck Spain is now on the right path of a cleansing campaign. So what else has happened in the meantime? The main problem continues with Catalonia’s present government determined to hold a referendum sometime this year. Sr. Artur Mas, the previous president and main architect has been charged of illegally holding the previous referendum and is up before the Spanish courts. Then we have the extreme left party Podemos that recently held their party convention to decide who was going to be or continue to be General Secretary. Sr. Pablo Iglesias was elected versus his number 2, Iñigo Errejon who lost and has been sent to Coventry. It is a pity because the latter was trying to moderate the party’s political program whereas Sr. Iglesias is determined to, in his words, ‘take the fight to the streets’. In other words he intends to turn the Spanish parliament into a circus whilst his followers are out and about stirring the masses into some sort of communist revolt. Finally we have dear old Brexit and what to do with all the Brits that live in Spain when Mrs. Theresa May pushes out the boat. And, above all we must not forget Gibraltar. The government is caught between a rock and a hard place. In other words keep on friendly terms with the UK but not forget that the ‘Rock’ has been and is a prime and juicy prize just waiting to be taken once it may no longer be protected by Britain’s membership of the EU.